We pause in the “Season of Sports” series to commemorate the 4th of July, Independence Day. 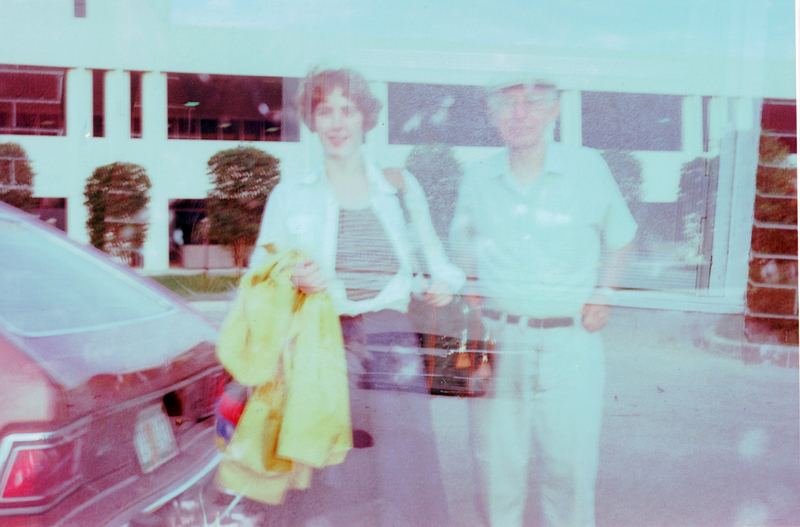 It was the summer I went to France, the summer I had an Exotic Foreign Affair, the summer that ended here, at the Indianapolis airport, where thanks to a malfunctioning camera, I have this portrait of two ghosts–my father, deceased 1987, and me age 21. I wrote and re-wrote about that summer, until eventually I had a version that tied for first place in the Women’s Memoirs “Independence Day” theme contest in 2011. Titled “Make Love Not War”, that version of the story of my brief love affair with an Arab Terrorist went on to be selected for Women’s Memoirs’ compilation series, Seasons of Our Lives: Summer, and I was asked to record the story for the book trailer in early 2014.